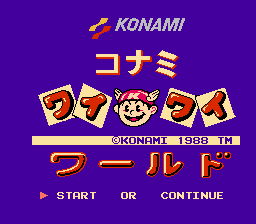 Konami Wai Wai World is an action game for the Nintendo Entertainment System. The game is a mashup of Konami game franchises and characters. The main characters, Konami Man and Konami Lady, are original characters for the game, but makes special appearances in other Konami games. Characters included as playable characters are Goemon from the Goemon series, Simon from the Castlevania series, Moai from the Gradius series (not to be confused with Moai-kun where that game was released 2 years after this game), Fuuma from Getsu Fuuma Den, Mikey from The Goonies game, and Kong from King Kong 2 game. Its gameplay is more of Castlevania in terms of platforming. It also has a vertical shooting stage featuring TwinBee and Gradius. This was actually finished in August 1997, which is OLD old. That patch from back then was for the FFE hack of the game, and that’s bad, so another patch was released a few months later for the good rom. But, it was missing some stuff that was in the FFE translation, so the patch was quietly updated on the homepage with no version change or anything. This patch is also mysteriously missing from the Demiforce website right now, but trust me, this translation actually did happen. The translation’s not bad, but you can tell Demi didn’t exactly go by the book with this one. It’s cool though, because the game itself isn’t really very serious or anything. This is listed as Incomplete because the text that appears when you win the card game hasn’t been finished. Everything else is cool though, I think.